For Sulcorebutia and Weingartia, I use a mix of 50 % of compost (sold as “compost for seedlings and cuttings”) and 50 % of gravel. That mix could probably be more nutritive but I prefer to use a very porous soil and avoid any rot due to too much moisture. Some watering with a fertilizer will compensate the lack of nutrient. For Cintia, I use a more mineral mix : 10 % compost and 90 % gravel. I repot the young plants every year (for a faster growing). The older plants (big enough to fill a pot of 9cm) are repotted only every two years. Some Sulcos have a big tap root : it cannot be hurt at all. If it is the case let it dry and heal for a week before repotting. If you don’t do this, the plant will probably rot. Though it can be done all through the spring and summer months, February – March is an appropriate period for repotting. At that period, the weather being still cool, a very dry soil must be used. I avoid to repot at the beginning of spring because most of Sulcorebutias already have their buds and they might be damaged during the process. When you water the whole soil in the pot should be wet (however be careful with Cintia because this plant has a tendency to explode due to excess water). Let the substrate dry out completely before a new watering. Watering should be stopped by mid-October and starts again by mid-April. These are the theorical dates according to the climate over here. But sometimes you have to bend the rules ! Mind the weather ! In the autumn, daytime temperature in the greenhouse can still be high. And this is a problem for the plants because they might not stop completely vegetating and might already have to draw on their reserves which should be used during winter. This is even a bigger problem for smaller plants or young cuttings because they might be completely dried up before springtime. 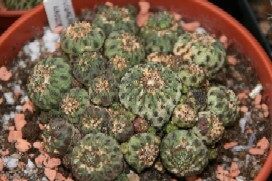 So I spray them with water in the morning in order that they are dry again before the night cold is back (the “cold – wet” combination must be avoided for it is often fatal for cacti). In the springtime on sunny days I also spray them with water. At the beginning, very slightly, the vaporizer turned on a position to produce a very light fog. As mid-April is coming the vaporizer is turned on a position to produce a thicker fog and finally a light rain. The plants very dried out and soft get a little bit more water. The goal is not to wet completely the soil but just to give the plant some moisture. Keep in mind that everything should be dried out before the night. My Sulcos are exposed in the full heat of the sun. Though on the hottest summer days they are shaded from the sun with a veil. 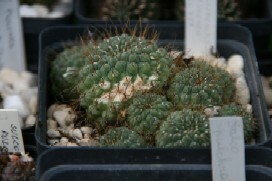 Other collectors told me that they use no protection at all but the greenhouse must be then very very well-ventilated. Also at the very start of springtime, you should pay attention to the sun because the plants can’t bear it after the winter months. If they are exposed in the full sun without any transition, they are condemned to get burnt. The usual pests in the collections are mealy bug and red spider mite. You can find in any garden centre insecticides to fight them effectively. Red spider mites are invisible to the naked eye. You realise that they are on the plants when it is too late, as you discover their damages : brown or orange marks on the skin of the plant. As a preventive measure I treat my Sulcos from May with a pesticide containing as active principle, for example, tébufenpyrad. Mealy bugs are easier to detect : they develop white cotton-like heaps most of the time in some inaccessible nook of the plant. 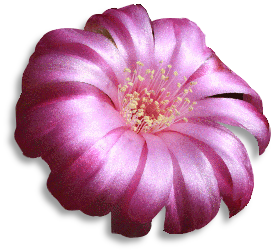 You can use a pesticide in which the active principle is imidacloprid for example. This pesticide can be used by spraying or in watering. Mealy bugs can live in the roots of the plants too. Use the repotting to check the roots. If you find any of those white heaps you’ll have to take off the soil completely and soak the roots in the pesticide for one hour before repotting. If you have to use a pesticide several time in the same season, you’d better use pesticides containing different active principles in order to avoid a “pesticide-resistance” from the insects.